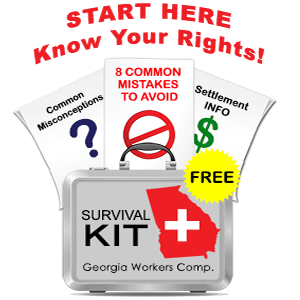 Generally I tell my clients that they should be covered under the Georgia workers’ compensation law if their injury occurred when they were “on the clock.” However, employers will sometimes attempt to deny claims in which there is evidence that the injury actually happened at home or during the employee’s personal time. Here is an extreme example: let’s say that on a Friday afternoon, Tom fell down a flight of stairs at his home and hurt his back. That night he went to the emergency room and was prescribed pain pills. Tom stayed in bed all day on Saturday and Sunday but came to work on Monday. During the next two weeks Tom managed to avoid any significant lifting and he continued to work. He also received a pain injection by his personal doctor. Three weeks after the fall at home, Tom attempted to lift a chair and felt a sharp pain in his back. Tom filed for workers’ compensation but his employer has controverted his claim on the grounds that the herniated disc in Tom’s back arose from the fall at home and not from Tom’s attempt to lift a 20 lb. chair at work. In this example, Tom would have a difficult time proving that his injury arose out of an in the course of employment. There is strong evidence that he was seriously injured at home and that his disc problems arise from the fall down the flight of stairs. It is probable that a workers’ compensation judge would rule that Tom’s back injury did not arise in the course of his employment. Now, let’s change the facts a little. In our new example, let’s say that Tom fell down the flight of stairs and went to the emergency room, where x-rays were taken that showed nothing more than a bruise. Tom returned to work on Monday and worked his regular duty for the next three weeks – and during that time he regularly lifted 50 to 75 lbs. without incident. Four weeks after his fall at home, Tom and a co-worker were lifting a 75 lb. cabinet and the co-worker slipped, causing all of the weight to tilt towards Tom, who twisted hard to the left trying to stabilize the cabinet. Tom felt a twinge, and within 2 hours, he was in excrutiating pain and unable to stand upright. An MRI taken two days later showed a severe herniated disc. In this example, the employer would most likely not be successful in denying Tom’s claim on the grounds that he injured himself at home and not at work. While his injury at home may have made Tom slightly more susceptible to a back injury, there is no evidence that his disc herniation arose from the fall down the flight of stairs. Further, the cabinet incident at work clearly was of a severity that the herniated disc is a likely outcome. Most workers’ compensation judges would find that Tom’s back injury arose out of and in the course of employment. I hope you can see from these examples that the facts surrounding most work injuries are not black and white. Working men and women – expecially those who perform jobs that involve physical labor – will incur normal aches and pains of daily life. They will bowl and play softball, and they will mow their lawns and work around their homes. Employers will attempt to use these personal time activities to deny claims, even when there is little relationship between the home activity and the legitimate on-the-job injury. Often a turning point in a workers compensation case can occur near the beginning of a case, when our client makes his first visit to the workers’ comp doctor. I advise my clients to be completely truthful with their (company) doctor but to be equally clear in drawing a distinction between the pain and weakness associated with the work injury and pain associated with an at-home accident. I sometimes see cases in which my client has not been as clear about distinguishing two incidents or accidents as he should have been, thereby making his workers’ compensation case more difficult than it could have been. This question of how to speak clearly to a work injury treating doctor is one of the reasons why I encourage potential workers’ compensation clients to hire me as early in the process as possible.